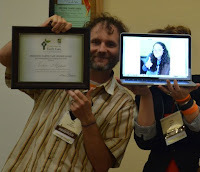 The William Gibson Eco-Justice Award was presented to Rev. Dr. Patricia K. Tull, who is A. B. Rhodes Professor Emerita of Old Testament, Louisville Presbyterian Seminary, Program Director for Hoosier Interfaith Power and Light, and author of “Inhabiting Eden: Christians, the Bible, and the Ecological Crisis.” Dr. Tull is a GreenFaith Fellow, frequent speaker, and workshop leader. William E. Gibson was a PEC founding member, author and eco-justice advocate and this award is named in his memory. of the Restoring Creation Award. AIR was founded at First Presbyterian in Deland, Florida in 1992 with the mission, “to implement sustainable farming methods for poor farmers in Central America in order to protect water sources, reduce hunger and malnutrition while protecting the gift of creation.” Since then, AIR’s team has planted more than 4.2 million trees in Guatemala and Nicaragua, trained 3,000 families in sustainable farming, built over 800 efficient stoves, and started dozens of micro-businesses. Anne Hallum is the Founding President. 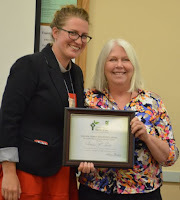 Presbyterians for Earth Care (PEC) presented a new award this year to a young adult who has outstanding leadership potential for eco-justice. 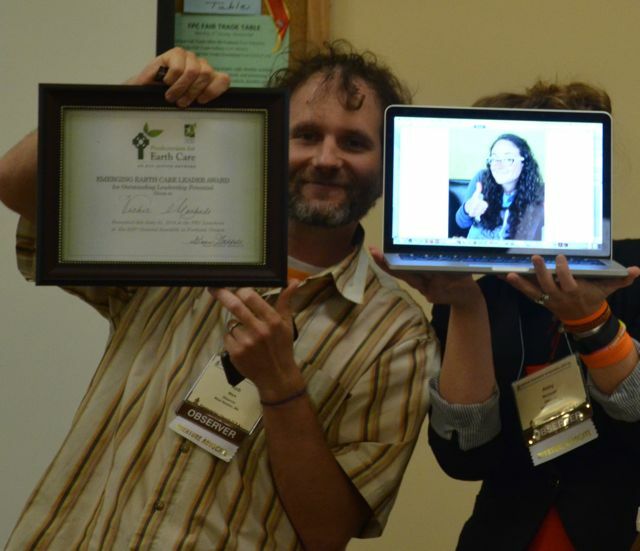 The first Emerging Earth Care Leader Award went to Vickie Machado. Vickie serves on the Leadership Team of the Eco-Stewards Program and served as a young adult leader in the Catholic Worker House in Gainesville. She also fought fracking as an organizer for Food & Water Watch Florida and was selected to participate in the Archdiocese of Miami’s Young Adult Papal Visit to Cuba. PEC Steering Committee members and volunteers also staffed a booth in the General Assembly Exhibit Hall at the Oregon Convention Center that expanded on our water theme. At the booth was a water cooler that was sometimes empty and served as a bulletin board for posting messages about the upcoming crisis regarding drinking water shortages, droughts and floods. Visitors could take the bottled water quiz, sign the bottled water pledge, and pick out a scripture about water for reflection during the day. 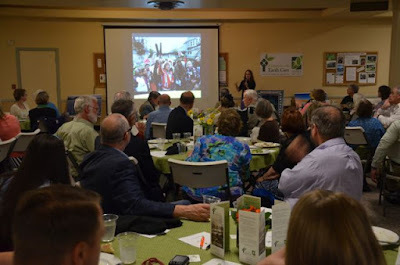 One hundred people attended the Luncheon and hundreds of people came through the Exhibit Hall and had the opportunity to learn how PEC supports people of faith working towards “environmental wholeness with social justice." I want to write to you today about Overture 09-01 from San Francisco Presbytery, “On PC(USA) Fossil Fuel Divestment.” PEC has supported this overture from the beginning of its predecessor and several of us on the PEC Steering Committee have also worked on the Fossil Free PCUSA Steering Committee. 1. Express its profound concern about the destructive effects of climate change on all God’s creation and divest from fossil fuels even as we reduce our use of fossil fuels and shrink our carbon footprint. 2. Call upon the Board of Pensions and the Presbyterian Foundation to immediately stop new investments in fossil fuel companies, and within three years, divest from the fossil fuel companies identified in the Carbon Underground 200 list. 3. Call upon the Stated Clerk to inform affected companies of this action. 4. Call upon all levels of the denomination (presbyteries, congregations, and individual members) in taking action to slow climate change. You can read the full text of the overture. Divestment is a way for we people of faith to act out our theology. We believe that caring for creation is an integral part of who God calls us to be. We can’t care for creation well if we are invested in companies that destroy creation as part of their business model. We are called to be prophetic models of change, so we must model what it means to put our treasure where our hearts are. And so it matters where we put our investments—how we make money is a symbol for who we are as people who follow Jesus, people who are called to love with our whole selves. If we make money from fossil fuel companies, it doesn’t matter if we put that money back into local food or hybrid cars or recycled paper—it’s money that comes from companies that burn fossil fuels and wreak havoc on the planet. That’s why divestment needs to be part of our response to climate change. But divestment from fossil fuels has never just been about money. It’s also a way to change society and speak up against the destruction of God’s good earth. So, if you’re a commissioner at General Assembly, please support this overture to divest from fossil fuels. 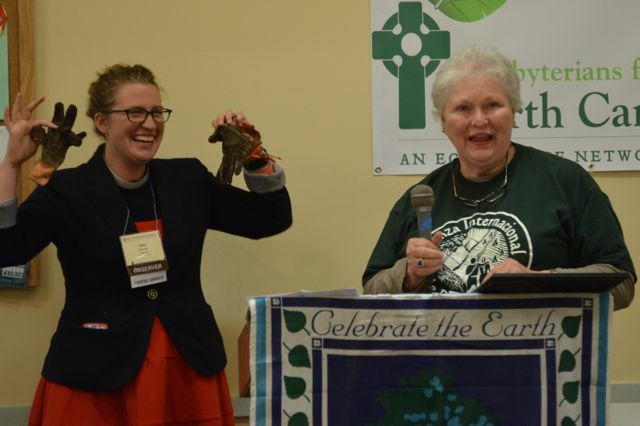 Fossil Free PCUSA will be joining PEC at General Assembly—we’ll even be together in the exhibit hall in Booths 208 and 210. 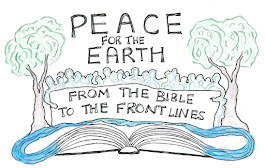 To learn more about Fossil Free PCUSA visit our website, follow our blog or follow us on Facebook. 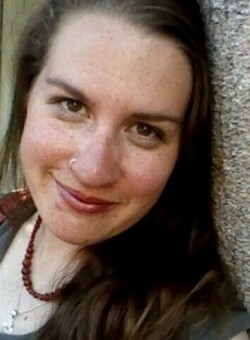 Abby Mohaupt is an eco-feminist theologian and ordained PC(USA) teaching elder inNorthern California. She holds a Master of Divinity and a Master of Theology from McCormick Theological Seminary. She currently serves as the Faith Community Liaison and Volunteer Coordinator of Puente de la Costa Sur in Pescadero, CA, a resource center for farmworkers and families.